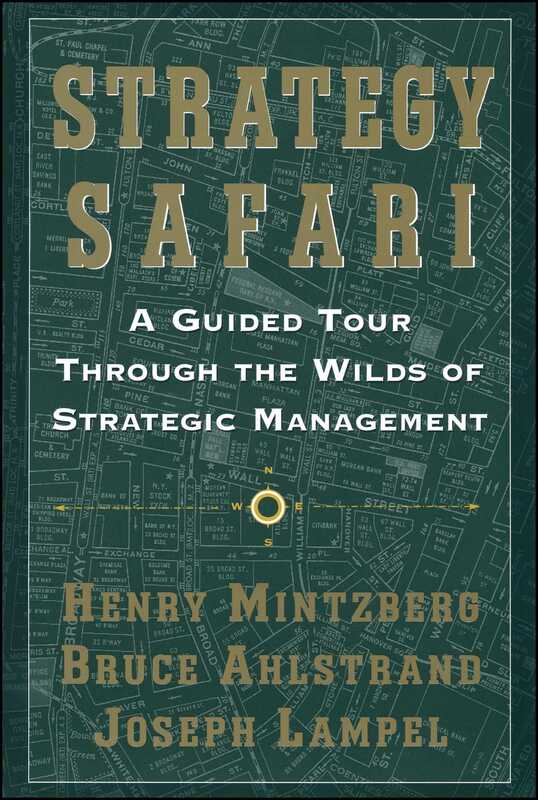 Strategy Safari, the international bestseller on business strategy by leading management thinker Henry Mintzberg and his colleagues Bruce Ahlstrand and Joseph Lampel, is widely considered a classic work in the field. No other book synthesizes the entire history and evolution of strategic management in so lively and entertaining a fashion. Since the initial publication of Strategy Safari, managers, consultants, and academics all over the world have found this book an indispensable and delightful tool—it has been translated into more than ten languages, including Chinese, Russian, and French, and has been used in top MBA programs worldwide. Strategy Safari makes sense of a field that often seems to make no sense. Mintzberg, Ahlstrand, and Lampel pair their sweeping vision of strategy making with an authoritative catalog in which they identify ten schools of strategy that have emerged over the past four decades. Why struggle through the vast, confusing terrain of strategy formation? With clarity and depth, Strategy Safari maps the strategic landscape and facilitates intelligent, informed strategy formation. Chapter One: "AND OVER HERE, LADIES AND GENTLEMEN: THE STRATEGIC MANAGEMENT BEAST"
Is very like a wall." We are the blind people and strategy formation is our elephant. Since no one has had the vision to see the entire beast, everyone has grabbed hold of some part or other and "railed on in utter ignorance" about the rest. We certainly do not get an elephant by adding up its parts. An elephant is more than that. Yet to comprehend the whole we also need to understand the parts. The next ten chapters describe ten parts of our strategy-formation beast. Each forms one "school of thought." These ten chapters are framed by this first chapter, which introduces the schools as well as some ideas about strategy itself, and a last chapter which returns to the whole beast. In a colorful article entitled "The Magic Number Seven, Plus or Minus Two: Some Limits on Our Capacity for Processing Information," psychologist George Miller (1956) asked why we tend to favor a quantity of about seven for categorizing things -- for example seven wonders of the world, seven deadly sins, and seven days of the week. This reflects our cognitive makeup, he concluded: seven is about the number of "chunks" of information that we can comfortably retain in our short-term memories. Three wonders of the world would fall a little flat, so to speak, while eighteen would be daunting. But those of us interested in strategy are, of course, no ordinary mortals -- at least in terms of our cognitive capacities -- and so should be able to comprehend, say, one more than the magic number seven plus two. Accordingly, this book proposes ten schools of thought on strategy formation. Cognition aside, in reviewing a large body of literature, ten distinct points of view did emerge, most of which are reflected in management practice. Each has a unique perspective that focuses, like each of the blind men, on one major aspect of the strategy-formation process. Each of these perspectives is, in one sense, narrow and overstated. Yet in another sense, each is also interesting and insightful. An elephant may not be a trunk, but it certainly has a trunk, and it would be difficult to comprehend elephants without reference to trunks. The handicap of blindness does have an unexpected advantage, sharpening the other senses to the subtleties that can escape those who see clearly. Our ten schools fall into three groupings. The first three schools are prescriptive in nature -- more concerned with how strategies should be formulated than with how they necessarily do form. The first of these, which presented in the 1960s the basic framework on which the other two built, focuses on strategy formation as a process of informal design, essentially one of conception. The second school, which developed in parallel in the 1960s and peaked in a flurry of publications and practice in the 1970s, formalized that perspective, seeing strategy making as a more detached and systematic process of formal planning. That school was somewhat displaced in the 1980s by the third prescriptive school, less concerned with the process of strategy formation than with the actual content of strategies. It is referred to as the positioning school because it focuses on the selection of strategic positions in the economic marketplace. The six schools that follow consider specific aspects of the process of strategy formation, and have been concerned less with prescribing ideal strategic behavior than with describing how strategies do, in fact, get made. Some prominent writers have long associated strategy with entrepreneurship, and have described the process in terms of the creation of vision by the great leader. But if strategy can be personalized vision, then strategy formation has also to be understood as the process of concept attainment in a person's head. Accordingly, a small but important cognitive school has also developed that seeks to use the messages of cognitive psychology to enter the strategist's mind. Each of the four schools that follow has tried to open up the process of strategy formation beyond the individual, to other forces and other actors. For the learning school, the world is too complex to allow strategies to be developed all at once as clear plans or visions. Hence strategies must emerge in small steps, as an organization adapts, or "learns." Similar to this, but with a different twist, is the power school, which treats strategy formation as a process of negotiation, whether by conflicting groups within an organization or by organizations themselves as they confront their external environments. In contrast to this is another school of thought that considers strategy formation to be rooted in the culture of the organization. Hence the process is viewed as fundamentally collective and cooperative. And then there are the proponents of an environmental school, organization theorists who believe strategy formation is a reactive process in which the initiative ties not inside the organization, but with its external context. Accordingly, they seek to understand the pressures imposed on organizations. Our final group contains but one school, although it could be argued that this school really combines the others. We call it configuration. People in this school, in seeking to be integrative, cluster the various elements of our beast -- the strategy-making process, the content of strategies, organizational structures and their contexts -- into distinct stages or episodes, for example, of entrepreneurial growth or stable maturity, sometimes sequenced over time to describe the life cycles of organizations. But if organizations settle into stable states, then strategy making has to describe the leap from one state to another. And so, another side of this school describes the process as one of transformation, which incorporates much of the huge prescriptive literature and practice on "strategic change." These schools have appeared at different stages in the development of strategic management. A few have already peaked and declined, others are now developing, and some remain as thin but nonetheless significant trickles of publication and practice. We shall describe each school in turn, with our own interpretation of its development and its difficulties, before concluding with our final integrative comments in the closing chapter. Note that all of these schools can be found in the literature, often in very clearly delineated pockets: particular academic journals, special practitioner magazines, certain styles of books. But most are, or have been, equally evident in practice, both within organizations and from the consulting firms that serve them. Practitioners read and are influenced by the literature, just as the literature is influenced by the practice. So this is a book of the school of thought on strategy formation both in publication and in practice. The literature of strategic management is vast -- the number of items we reviewed over the years numbers close to 2,000 -- and it grows larger every day. Of course, not all of this comes from the field of management. All kinds of other fields make important contributions to our understanding of the strategy process. William Starbuck has written that to discuss "all aspects of organization which are relevant to adaptation...means...that one could legitimately discuss everything that has been written about organizations." This is, in fact, an understatement, because the last word in the quotation should read "collective systems of all kinds." What biologists write about the adaptation of species (for example it "punctuated equilibrium") can have relevance for our understanding of strategy as position ("niche"). What historians conclude about periods in the development of societies (such as "revolution") can help explain different stages in the development of organizational strategies (for example, "turnaround" as a form of "cultural revolution"). Physicists' descriptions of quantum mechanics and mathematicians' theories of chaos may provide insights into how organizations change. And so on. Add to this all the other literatures that are more commonly recognized as relevant to the study of organizations -- psychology on human cognition as well as leadership charisma, anthropology on cultures in society, economics on industrial organization, urban planning on formal planning processes, political science on public policy making, military history on strategies of conflict, and on -- and the result is an enormous, dispersed body of literature capable of rendering all sorts of insights. At the limit, strategy formation is not just about values and vision, competences and capabilities, but also about the military and the Moonies, crisis and commitment, organizational learning and punctuated equilibrium, industrial organization and social revolution. We consider this literature in its own terms. We do not, however, seek to review it comprehensively. (We had no more wish to write several thousand pages than most people have to read it.) This, in other words, is a field review, not a literature review. We seek to cover the literature and the practice -- to set out its different angles, orientations, tendencies. In so doing, we cite published work either because it has been key to a school or else because it well illustrates a body of work. We apologize to the many insightful writers and consultants whose work is not mentioned; we hope that we have left out no significant bodies of work. We must add one point, however. There is a terrible bias in today's management literature toward the current, the latest, the "hottest." This does a disservice, not only to all those wonderful old writers, but especially to the readers who are all too frequently offered the trivial new instead of the significant old. We express no such bias in this book. Ours is a review of the evolution as well as the current state of this field. Later in this book we argue that ignorance of an organization's past can undermine the development of strategies for its future. The same is true for the field of strategic management. We ignore past work at our own peril. Indeed, we believe that time works on the literature and practice of strategic management much like it works on wine in barrels: it reveals what is excellent. We therefore apologize to no one for reminding the reader of so many wonderful old publications. The word strategy has been around for a long time. Managers now use it both freely and fondly. It is also considered to be the high point of managerial activity. For their part, academics have studied strategy extensively for about two decades now, while business schools usually have as their final required capstone a course in strategic management. The word strategy is so influential. But what does it really mean? It is part of human nature to look for a definition for every concept. Most of the standard textbooks on strategy offer that definition, usually presented in the introductory chapter, more or less as follows: "top management's plans to attain outcomes consistent with the organization's missions and goals" (Wright et al.). No doubt such definitions have been dutifully memorized by generations of students, who have later used them in thousands of corporate reports. We offer no such easy definition here. Instead, we argue that strategy (not to mention ten such different schools about it) requires a number of definitions, five in particular (based on Mintzberg, 1987). Ask someone to define strategy and you will likely be told that strategy is a plan, or something equivalent -- a direction, a guide or course of action into the future, a path to get from here to there. Then ask that person to describe the strategy that his or her own organization or that of a competitor actually pursued over the past five years -- not what they intended to do but what they really did. You will find that most people are perfectly happy to answer that question, oblivious to the fact that doing so differs from their very own definition of the term. It turns out that strategy is one of those words that we inevitably define in one way yet often also use in another. Strategy is a pattern, that is, consistency in behavior over time. A company that perpetually markets the most expensive products in its industry pursues what is commonly called a high-end strategy, just as a person who always accepts the most challenging of jobs may be described as pursuing a highrisk strategy. Figure 1-1 contrasts strategy as plan -- looking ahead, with strategy as pattern -- looking at past behavior. There is a simple way to find out. Just ask those people who happily described their (realized) strategies over the past five years what their intended strategies were five years earlier. Were they the same? A few may claim that their intentions were realized perfectly. Suspect their honesty. A few others may answer that what they realized as strategies had nothing to do with what they intended. Suspect their behavior. In our experience, the vast majority of people give an answer that falls between these two extremes -- a bit of this and a bit of that, they say. They did not stray completely from their intentions, but neither did they achieve them perfectly. For, after all, perfect realization implies brilliant foresight, not to mention an unwillingness to adapt to unexpected events, while no realization at all suggests a certain mindlessness. The real world inevitably involves some thinking ahead as well as some adaptation en route. As shown in Figure 1-2, intentions that are fully realized can be called deliberate strategies. Those that are not realized at all can be called unrealized strategies. The planning school, for example, recognizes both, with an obvious preference for the former. But there is a third case, which we call emergent strategy -- where a pattern realized was not expressly intended. Actions were taken, one by one, which converged over time to some sort of consistency or pattern. For example, rather than pursuing a strategy (read plan) of diversification, a company simply makes diversification decisions one at a time, in effect testing the market. First it buys an urban hotel, next a restaurant, then a resort hotel, then another urban hotel with a restaurant, then a third of these, and so on, until a strategy (pattern) of diversifying into urban hotels with restaurants has emerged. As implied earlier, few, if any, strategies are purely deliberate, just as few are purely emergent. One means no learning, the other means no control. All real-world strategies need to mix these in some way: to exercise control while fostering learning. Strategies, in other words, have to form as well as be formulated. An umbrella strategy, for example, means that the broad outlines are deliberate (such as to move upmarket), while the details are allowed to emerge en route (when, where, and how). Thus, emergent strategies are not necessarily bad and deliberate strategies good; effective strategists mix these in ways that reflect the conditions at hand, notably the ability to predict as well as the need to react to unexpected events. Alongside plan and pattern, we can add two more "p" words. Some years ago, McDonald's introduced a new product called Egg McMuffin -- the American breakfast in a bun. This was to encourage the use of their restaurant facilities in the morning. If you ask people whether Egg McMuffin was a strategic change for McDonald's, you will inevitably hear two answers: "Yes, of course: it brought them into the breakfast market," and "Aw, come on, it's the same old stuff -- the McDonald's way -- just in a different package." In our view, the real difference between these people is in how they implicitly define the content of strategy. To some people, strategy is a position, namely the locating of particular products in particular markets -- Egg McMuffin for the breakfast market. As Michael Porter reiterated recently, "Strategy is the creation of a unique and valuable position, involving a different set of activities." To others, strategy is a perspective, namely an organization's fundamental way of doing things the McDonald's way. In Peter Drucker's memorable phrase, this is its "theory of the business." As shown in Figure 1-3, as position, strategy looks down -- to the "x" that marks the spot where the product meets the customer, as well as out -- to the external marketplace. As perspective, in contrast, strategy looks in -- inside the organization, indeed, inside the heads of the strategists, but it also looks up -- to the grand vision of the enterprise. Thus, we have four different definitions of strategy. A fifth is in common usage too: strategy is a ploy, that is, a specific "maneuver" intended to outwit an opponent or competitor. A kid may hop over a fence to draw a bully into his yard, where his Doberman Pinscher waits for intruders. Likewise, a corporation may buy land to give the impression it plans to expand its capacity, in order to discourage a competitor from building a new plant. Here the real strategy (as plan, that is, the real intention) is the threat, not the expansion itself, and as such is a ploy. Five definitions and ten schools. As we shall see, the relationships between them are varied, although some of the schools have their preferences -- for example, plan in the planning school (as noted), position in the positioning school, perspective in the entrepreneurial school, pattern in the learning school, ploy in parts of the power school. There may not be one simple definition of strategy, but there are by now some general areas of agreement about the nature of strategy. The accompanying box summarizes these. Advantage: The main role of strategy is to chart the course of an organization in order for it to sail cohesively through its environment. Disadvantage: Strategic direction can also serve as a set of blinders to hide potential dangers. Setting out on a predetermined course in unknown waters is the perfect way to sail into an iceberg. While direction is important, sometimes it is better to move slowly, a little bit at a time, looking carefully but not too far ahead, as well as to each side, so that behavior can be shifted at a moment's notice. Advantage: Strategy promotes coordination of activity. Without strategy to focus effort, chaos can ensue as people pull in a variety of different directions. Disadvantage: "Groupthink" arises when effort is too carefully focused. There may be no peripheral vision, to open other possibilities. A given strategy can become too heavily embedded in the fabric of the organization. Advantage: Strategy provides people with a shorthand way to understand their organization and to distinguish it from others. Strategy provides meaning, plus a convenient way to compre, hend what the organization does. Disadvantage: To define an organization too sharply may also mean define it too simply, sometimes to the point of stereotyping, so that the rich complexity of the system is lost. Advantage: Strategy is needed to reduce ambiguity and provide order. In this sense, a strategy is like a theory: a cognitive structure to simplify and explain the world, and thereby facilitate action. Disadvantage: Ralph Waldo Emerson said that "A foolish consistency is the hobgoblin of little minds...." Creativity thrives on inconsistency -- by finding new combinations of hitherto separate phenomena. It has to be realized that every strategy, like every theory, is a simplification that necessarily distorts reality. Strategies and theories are not reality themselves, only representations (or abstractions) of reality in the minds of people. No one has ever touched or seen a strategy. This means that every strategy can have a misrepresenting or distorting effect. That is the price of having a strategy. We function best when we can take some things for granted, at least for a time. And that is a major role of strategy in organizations: it resolves the big issues so that people can get on with the little details -- like targeting and serving customers instead of debating which markets are best. Even chief executives, most of the time, must get on with managing their organizations in a given context; they cannot constantly put that context into question. There is a tendency to picture the chief executive as a strategist, up there conceiving the big ideas while everyone else gets on with the little details. But the job is not like that at all. A great deal of it has to do with its own little details -- reinforcing the existing perspective (and "culture") through all kinds of figurehead duties, developing contacts to find important information, negotiating agreements to reinforce existing positions, and so on. The problem with this, of course, is that eventually situations change -- environments destabilize, niches disappear, opportunities open up. Then all that is constructive and effective about an established strategy becomes a liability. That is why, even though the concept of strategy is rooted in stability, so much of the study of strategy focuses on change. But while formulas for strategic change may come easily, the management of that change, especially when it involves shifting perspective, comes hard. The very encouragement of strategy to get on with it -- its very role in protecting people in the organization from distraction -- impedes their capacity to respond to changes in the environment. In other words, retooling is expensive, especially when it is human minds, and not just machines, that have to be retooled. Strategy, as mental set, can blind the organization to its own outdatedness. Thus we conclude that strategies are to organizations what blinders are to horses: they keep them going in a straight line but hardly encourage peripheral vision. All this leads to our final conclusion, which is that strategies (and the strategic management process) can be vital to organizations by their absence as well as their presence. Also for better and for worse, strategic management has become an academic discipline in its own right, like marketing and finance. The field has its own academic journals, its own "clubs," its own conferences. Its literature is vast and, since 1980, has been growing at an astonishing rate. There has been a general tendency to date that literature back to the mid-1960s, earlier perhaps to a 1951 book by William Newman, but the writings on military strategy go back much further: indeed, Sun Tzu wrote his Art of War in about the fourth century B.C. For the most part, the teaching of strategic management has highlighted the rational and prescriptive side of the process, namely our first three schools (design, planning, and positioning). Strategic management has commonly been portrayed as revolving around the discrete phases of formulation, implementation, and control, carried out in almost cascading steps. This bias is heavily reflected in practice, particularly in the work of corporate and governmental planning departments as well as of many consulting firms. This book departs from this traditional view in its attempt to provide a more balanced survey of the field, with all of its contradictions and controversies. Significant space is given to the nonrational/nonprescriptive schools, which point to other ways of looking at strategic management. Some of these schools have a less optimistic view about the possibility for formal strategic intervention. Where we become unbalanced somewhat is in our critiques of the different schools. The three prescriptive schools have so dominated the literature and practice that we find it appropriate to include rather extensive discussions that bring much of this conventional wisdom into question. Of course, we critique all ten schools, since each has its own weaknesses. But when people are seated on one side of a see-saw, it makes no sense to try to get them into balance by pulling from the center. Put differently, to maintain balance among our critiques of the ten schools would only help to perpetuate the unbalance that we believe currently exists in the literature and practice. Pervasive strategic failure in many large corporations may well be attributed to the army of business school graduates who have been sent out with an incomplete tool kit. This book seeks to open up the range of perspectives by providing a more varied set of ideas for such students as well as practicing managers. As Hart has noted, "High performing firms appear capable of blending competing frames of reference in strategy making. They are simultaneously planful and incremental, directive and participative, controlling and empowering, visionary and detailed." Or, as F. Scott Fitzgerald put it, more bluntly: "The test of a first-rate intelligence is the ability to hold two opposed ideas in the mind at the same time and still retain the ability to function." To function as a strategist, of course, means not just to hold such opposing views, but as Spender (1992) has pointed out, to be able to synthesize them. We ask you, the reader, to hold ten such views! The field of strategic management may itself be moving toward such synthesis. As we shall see, some of the newer work cuts across our schools. This may seem to make a bit of a mess of our framework. But our schools may, in fact, help us to see how this work draws important aspects of strategy formation together. We applaud such work, and cite it where we can. It suggests a certain coming of age of the field. But synthesis cannot happen in general. It must ultimately take place in the specific mind of the beholder, namely you the reader. We shall provide help where we can, but the task is up to those who deal with strategy in their jobs. We all know what a whole elephant is, yet we often have to describe it by its parts. That is in the nature of verbal description: words in linear order, chapters in a book. So hang on -- here we go! 7. Which of the strategy schools are most alike? Which are most unlike? Henry Mintzberg is the author of several seminal books, including The Nature of Managerial Work, The Rise and Fall of Strategic Planning, and Managers Not MBAs. He is Cleghorn Professor of Management Studies at McGill University. Joseph Lampel is Professor of Strategy at Cass Business School, at City University London. He is the co-editor of the fourth edition of The Strategy Process and of The Business of Culture: Strategic Perspectives in Media and Entertainment. Bruce Ahlstrand is a Professor at Trent University in Ontario. "Read the book. Let Henry Mintzberg, Bruce Ahlstrand, and Joseph Lampel guide you on an enlightening and entertaining excursion through the field of strategy making." "Strategy Safari makes a convincing case for juggling several approaches at once. This book furnishes the complete tool set for every manager involved in strategy formation."